The Boardwalk Beast is down for maintenance. Experience an incredible 25 minute thrill ride on Galveston Bay while cruising at speeds up to 40 mph. 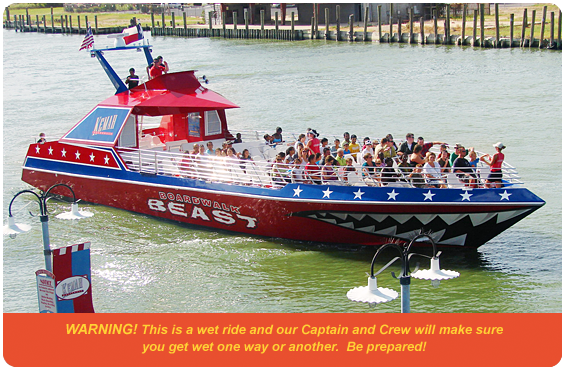 The Beast will take you approximately 4 miles out into the Galveston Bay. During your cruise you will be blasted with wind, music and entertainment. Roaring through the air "the Beast is unleashed"! These tickets are NOT included in the All Day All Ride Pass. $2 military discount available on Boardwalk Beast tickets. Must show valid military ID when purchasing - Please visit the ticket booth for more details. The Boardwalk Beast ride schedule changes based on the season. The schedule is subject to change without notice. Have a suggestion for the Beast? Please contact the Boardwalk Beast Crew at bgarza@ldry.com. Please Note: The Boardwalk Beast is not 100% wheelchair accessible. Guest who are wanting to ride the Beast must be able to transfer from their wheelchair to a regular seat to ride. Guests with disabilities must have upper body strength and sit up straight in a regular seat to ride. We cannot guarantee 100% accessibility due to low tides, high tides and/or aisle width – based on wheelchair size.